Yesterday we posted about the launch of Edward to Rock Street section of the Greenway, well it seems that Minister Kelly had even more good news up his sleeve! Today he announced that CIE has agreed to divest it unused railway lands in the county to Kerry County Council, land which will allow for the completion of not only the Tralee to Fenit Greenway but also the extension of the Great Southern Trial into Kerry, Radio Kerry have an audio clip from the Minister. While this news is more than welcome lets hope that this is progressed in a proper and timely manner,as some of you may remember that CIE agreed to sell this land to Kerry Co. Co. back in the 1980’s. So fingers crossed that this time it doesn’t get derailed. 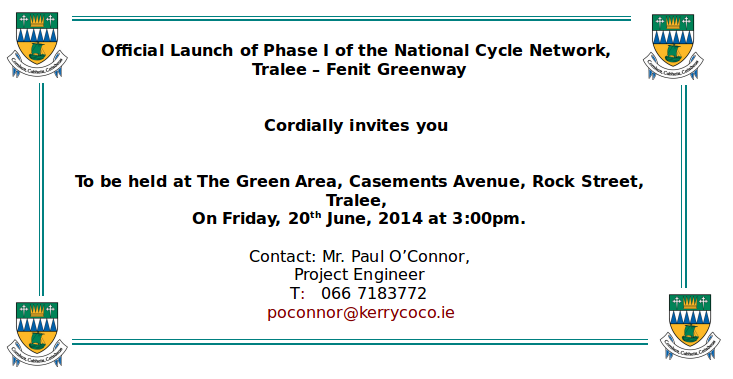 This Friday will see the official launch by Minister Alan Kelly of Phase I (we presume this should be Phase II) of the Tralee-Fenit Greenway (Casements Railway Station-Rock Street section) as part of the National Cycle Network. The launch be held at The Green Area. Casement: Avenue, Rock street, Tralee on Friday, 20m June, 2014 at 3:00pm. The completion of this section of the route will see all of the former railway in Tralee back in use for transport, and will provide a direct link for the population along it with Kerry’s main transportation hub. It will also connection with the short ‘Big River Path’ to provide students of Tralee CBS with a dedicated safe off road route to their school.